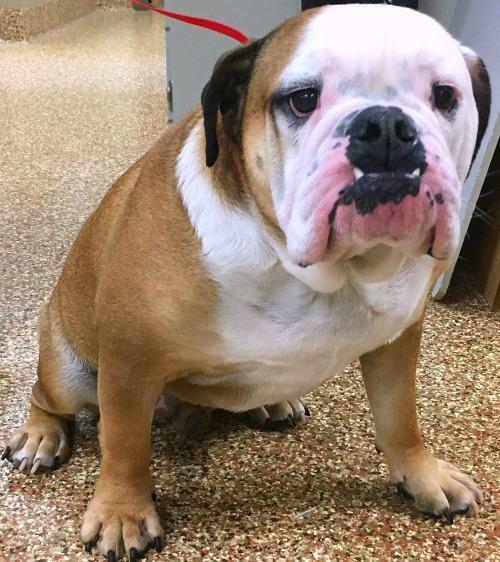 Diesel is a beautiful two year old English Bulldog. Diesel’s Pet-Parents were concerned when he showed signs that he was very sick, including excessive vomiting. 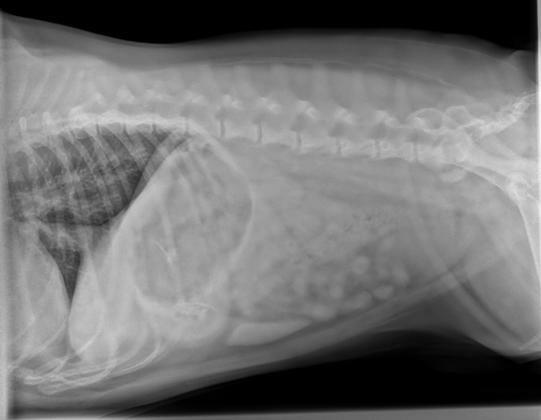 We quickly took X-Rays in order to get a look at what was happening inside Diesel’s body. X-Rays work by aiming high energy particles at the part of the body we want to see and taking an image of what is reflected. Different types of material have different densities, and these different densities reflect different amounts of x-rays. High-density materials, like bone and metal, show up bright white, while air is black, and water and fat are grays in between. When a pet has something inside them that is a higher density, it shows up very bright against the relatively dark softer tissues. However, if something unusual is present but it has about the same density as the surrounding tissue, it will be difficult or impossible to see on the X-Ray. This was the case for Diesel. When x-rays showed nothing conclusive, Diesel was scheduled for exploratory surgery at Winslow Animal Hospital. Dr. Philippe Coudrai performed the surgery with help from our excellent surgical nurses. 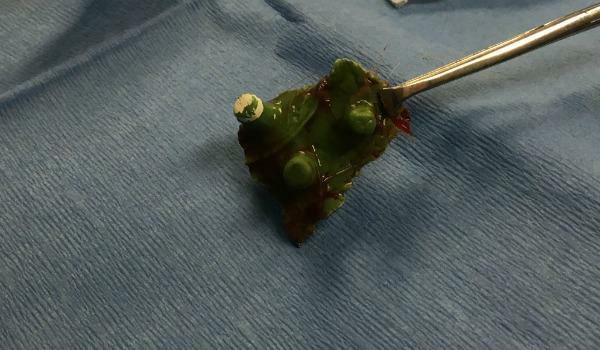 Exploratory surgery can be very useful in veterinary medicine. Its diagnostic and therapeutic benefits are helpful for cats and dogs alike. 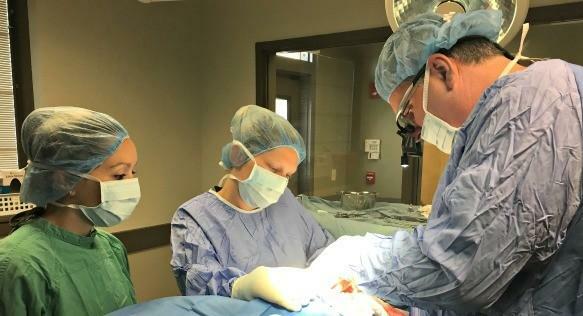 An exploratory surgery gives the veterinarian a chance to inspect a part of the body, the abdomen in this case, to find abnormalities that did not show up on other tests. In this case, the team suspected that Diesel may have swallowed an object that became lodged in his digestive tract, known as a foreign body. Foreign bodies sometimes do not cause health problems. There have been some stories of dogs swallowing objects and living with them in their stomachs for long periods of time. However, when a foreign body is of the right size and in a position that blocks the digestive tract, this is extremely dangerous for the pet and requires emergency surgery to remove. It’s not uncommon for an exploratory surgery to end in a foreign body removal. It turns out, the team was correct! They found this plastic piece inside Diesel’s digestive tract! It has been chewed and broken, but this green piece of plastic was hard and large enough to cause a disruption to Diesel’s digestion, and it made him miserable! It is not uncommon for dogs to swallow materials that cannot be digested. Whether from toys, household objects like socks, or even small rocks, many dogs have had foreign materials lodged in the digestive tract that have to be surgically removed. Not only is it dangerous to disrupt the digestion process, but foreign bodies also carry the risk of cutting or puncturing tissue, which can lead to painful and potentially deadly infections called peritonitis. If you suspect your dog may have a foreign body, call us right away at 856-875-1323. Diesel’s surgery went well, and now that the foreign body is removed, he can go back to life as a happy dog! We wish Diesel a speedy recovery!